First Day First Show - Kya Aap Panchvi Pass Se Tez Hain? Flop Show! After a great deal of suspense, drama and fanfare about the Reality TV Game Show (predicted to be one of the greatest television shows ever in Indian TV history) "Kya Aap Panchvi Paa Se Tez Hain?" I sat down to watch it for the first day first show (with great enthusiasm and expectations)at 8.00 pm telecast on Star Plus Channel today, and let me tell you that I was thoroughly disappointed with the whole show! And I mean every aspect of it! Why? you ask? Let me explain in detail. Well, for a start, I know it for a fact that this TV show started its campaign with a search for the so called Vth graders from all schools in Mumbai. My own son who was then in the IVth grade gave the answers to a test paper that was circulated in the whole class. He answered all the questions correctly (apparently he was the only student from all over Mumbai who got all the answers 100% correct)! He was then called for an "interview" to the studio of Synergy Adlabs, where they did all the motions of taking his photographs and the "interview" and sent him back saying that they would call him, if required! Of course, the call never came! So, it goes without saying that I was obviously curious to know who eventually got selected to participate in the show! Today I saw the programme and was certain that all the kids that are present on the show are all "models" that have been selected to just sit "pretty" on the show and "act" very intelligent! I have seen the girl called Shreya many times earlier in TV serials and advertisements. That's not the end of it, the first woman participant to appear in the show was supposed to be a PHD from Andhra University in the language of Hindi. Well, its amazing that she chose any and all subjects, but Hindi to answer questions from. She was too decked up and was overacting and obviously knew the answers to all the questions that were being asked! Everything from the start to the finish of the show was nothing but "acting"! There was nothing "Real" about the show at all! To come to the questions that were being asked,do they really think that we are unaware of what subjects are taught in classes 1st to 5th? Well, I can say with total confidence that NO class 2nd student would know what a "Prism" looked like or even what it is! So, forget knowing "how many edges there are in a prism! Which Class 1 student would know "Which Ocean has the greatest average depth?" Which class 3 student would know the detailed parts of a seed? We were taught this in the 11th std! Which class 3rd or even 4th or 5th for that matter student is taught Indian history in school, other than just general knowledge? And the surprising fact is that all the "kids" in the show answered "all" the questions correctly and seemed very confident of their answers! I challenge these same kids to come and answer questions from their own text books and then I would like to see how many answers they get right, and "How" confident they are of their answers! Another aspect that was encouraging, in the beginning, was that the program was being set up by none other than Sidhaarth Basu, who is known for many other such quiz programs which were very successful! So, the program having this standard of performance is a real "shocker!" So, all in all, the show is nothing but a "show" that's purely for entertainment and to collect money from the masses in the form of SMSes and phonecalls! It's perfectly clear that they never intended to call anyone from the general public and will also NOT be giving out any "REAL" cash! ITS ALL JUST A SHOW! I am thinking of all those poor kids who got their hopes up and thought they would get selected and sit next to their idol "Shah Rukh Khan" and then were let down and disappointed when they weren't! I know for a fact that my son was really let down and may begin to think that he was not "smart" enough for the show? There is a saying, "You can fool some of the people some of the time, but you cannot fool all the people all the time!" All in all, I pronounce this show as a total "Flop Show!" I am sure you can do better than this, Shah Rukh! How Much Is Your Blog Worth? Find Out ! There are many of us here on Xomba, who have a blog of their own. I have three and I have always wondered if there was some way besides the Adsense earnings that would tell me how good the blog is. I am sure that all of you, who have a blog, would also like to know their blog's true worth! So, is there a way to find out How Much Is Your Blog Worth? I have good news! I just came across this Widget called "How Much Is Your Blog Worth?" developed by Dane Carlson using Technorati's API. The applet used gives the value of your blog in dollars using a link to dollar ratio. So, go on and find out How Much Is Your Blog Worth? Now! Just click on the link in one of the widgets above. How To Recognise and Take Care Of The Cracked Tooth Syndrome! After the huge positive response that I got from my previous article on "Emergency relief in case of a toothache" (http://www.xomba.com/emergency_relief_in_case_of_a_toothache), I thought you would appreciate a similar article on another type of toothache that is also very common but very difficult to diagnose by a dentist. This is the Cracked Tooth Syndrome! Toothache, like I said can be very painful and excruciating and according to me is the worst kind of pain. This is exactly the kind of pain that you will experience if you have a "cracked tooth"! There are, of course, different categories of a cracked tooth. A tooth can fracture (I am speaking of "hairline" fracture) in many planes and may involve any of the three layers that it is made up of, namely; the enamel, dentin, or the pulp. The symptoms of a cracked tooth can vary from mild sensitivity to episodes of sharp and excruciating pain that lasts for some time and generally occurs when you bite on something hard or release the biting pressure on the affected tooth along the fracture line (typically)! You may also experience sensitivity in the affected tooth (locally) when you take anything hot or cold! This is different from generalized sensitivity of all teeth due to ageing. A cracked tooth can be difficult to diagnose for a dentist because of the conflicting signs and symptoms and the fact that it does not always show up in radiographs (X-rays). The tooth may have cracked due to any number of reasons like trauma, caries, old fillings, or any ill fitting prosthesis! If the crack or fracture of the tooth only involves the enamel, then chances are that the tooth may just chip off at that area or the crack may remain as a microscopic one and you may remain unaware of its existence as there will not be any signs or symptoms. Treatment for this type of crack is only cosmetic treatment, if the tooth is chipped off or you can also leave it as it is! 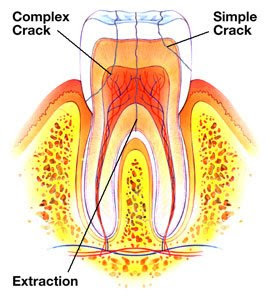 If the crack involves the second layer, that is the dentin, then you will experience sensitivity to hot and cold, the severity of which may be mild to severe, depending on the type of crack and how far it extends. Generally speaking, the closer the crack gets to the pulp of the tooth the more severe will be your pain. It will occur when you bite on something hard or release pressure to the tooth. You will experience a "sudden" sharp shooting pain that will definitely make you stop whatever you are doing at that point of time! The pain characteristically lingers on for some time and then lowers in intensity and then may either stop or will continue as a dull nagging pain! So, what do you do in case you are caught in this situation? You may rush to a dentist, the first thing, only to be told after examination of the tooth that it is perfectly fine! The dentist will take X-rays to confirm the condition of the tooth and will predictably, not find anything on it! This happens many a times, and I have personally experienced it! Remember, I said that this condition is not easy to diagnose, so don't be too harsh on your dentist either! Here's some suggestions on what you can do to help yourself in this condition. First of all, do make that trip to the dentist notwithstanding the consequences, for at least you can be sure that there is nothing else the matter with the tooth in question! But, again, you will have to first make the appointment with your dentist, and we all know how long the "wait" can be! So, what do you do in the meantime? How do you take care of the pain and sensitivity? # You can try taking a painkiller like brufen, paracetamol, or diclofenac sodium, etc. But, this is only to rule out any other cause of the pain. For, a painkiller will NOT be effective in this kind of pain. # You can try applying clove oil locally to the tooth in question, and it may sooth the pain as it is a very strong obtundent! # Try rinsing your mouth with warm saline. This may also help soothe the pain a little. # If you have any desensitizing toothpastes like sensodent K, thermoseal RA, sensodyne, or emoform,(there are many such toothpastes available in the market to choose from)then apply this paste to the affected tooth and keep it for a few minutes and rinse softly. Keep applying this paste regularly for a period of 10 -15 days instead of your regular toothpaste. This helps to seal the exposed dentin tubules and thus reduce the sensitivity of the tooth over a period of time! # For the time being, at least till you get to visit the dentist try to avoid eating anything hard or even to apply pressure to the tooth. So, have a soft diet. Also, it is better to avoid taking cold or hot beverages. Normally, this should sufficiently take care of the problem, unless it is complicated further due to the presence of other factors like a old filling, or prosthesis that needs adjustment etc. Any such factors will be taken care of by the dentist! Lastly, if the tooth is cracked and involves the pulp, then you may require either a rootcanal therapy with a crown or even extract the tooth depending on the severity and circumstances of the tooth in question. So, Do visit the dentist in case you suspect that you suffer from a "Cracked Tooth Syndrome"! Having to shift houses every year or two can be quite a tedious job! For the past five years, I must have shifted to about 6 - 8 houses. Each time I've had to tediously pack all the stuff in all the boxes in a very organized manner, so as to minimize the damages and also be able to find everything you need as soon as you start unpacking in the next house! Shifting houses means getting adjusted to a new house and its ways all over again! For, each house has its own rhythm. Also, finding a maid to help you in the new place is a job that is equivalent to the job of a HR manager! Well, everybody knows that to find a "good" maid and that too one with "character" and "integrity" is very hard to get! Every time I shift a house, my hunt for the "character maid" begins in great earnest, for I would like to settle down in my new house as soon as possible, and also would like my life to continue on like it has been till this moment! I begin my search process by advertising to my friendly neighbor to kindly spread the word through her maid. That's the best way to go about it, I've discovered! Trust me, word spreads like fire, and the very next day, I had a steady stream of likely candidates for the job interview! I need to be very patient if I want a really "good" maid! In the past I used to make the mistake of signing on the very first one that came my way, out of desperation! I have learned some very valuable lessons of selecting maids by my past experiences! So, now I want to be very careful and make sure that I have the "right" one. This time, I concentrated totally on the "character" of the maid and must have interviewed about a dozen when I started to feel a little desperate. Was I asking for too much! Looking for a maid servant with "character" and "integrity" in a place like Mumbai, is like looking for a needle in a haystack! But, just as I was beginning to despair and feel pessimistic about the whole affair, this maid appeared from right above my head, literally speaking, for she was working in the flat above mine! The moment I saw her, I knew she was the one I had been searching for. She appears to be sincere, honest and hardworking and to top it all is also a very good cook! Wow, can I ask for anything more? She has a very nice "character certificate" from her previous employer, the like of which I have never seen before, and she has it laminated! Well, of course, I have signed her on and hope that she will live up to her "Character Certificate"! My New Xomba Widget ! Hey guys, I got one too! Here's my new Xomba widget. This is really cool stuff. I simply love this look. I thought of testing it out and so am writing this post. Get to read all my posts here. Why should you post on Xomba? 1. You get paid to write about anything and everything here. 2. You get to meet and interact with really interesting people on this site from all over the globe and all walks of life. 3. Like Xomba says - "Read and expand your mind" Here! "Know Xomba, Know Fun! No Xomba, No Fun!" Have fun posting and get paid for it! The Indian Premier League took off with a spectacular opening ceremony at the M Chinnaswamy Stadium at Bangalore yesterday. None other than Mr.Vijay Mallya, who also hails from Bangalore, hosted the game. The stadium was jam packed with spectators and they were thoroughly entertained by a special troupe of cheerleaders and performers who were flown in from Washington for this special occasion. There was a special performance by Shankar, Ehsaan and Loy and it all ended with a spectacular round of fireworks that lit up the whole stadium and the skies! Wow! What a show it was, a truly great effort by Mr. Mallya. Trust him to do everything in style and he really knows how to add glamour to any occasion. Speaking of glamour, Shah Rukh Khan with his group of supporters from Bollywood were all there to cheer their team, the Kolkata Knight Riders in their very attractive black and yellow getup! All the 8 captains from the respective teams looked smart in the lineup at the end of the oath taking ceremony! The first match of the DLF Indian Premier League was played yesterday between Kolkata Knight Riders and the Royal Challengers under floodlights in front of a packed crowd in Bangalore. However, the match was not entirely without controversy. Restrictions placed on news agencies by the Indian Premier League led to a row, culminating in a coverage boycott by Reuters, AP and AFP. As a result, no pictures of the match were available for newspapers or websites. The match itself was pretty uneven with the Kolkata Knight Riders easily taking the lead with a massive contribution and spectacular display of batting by Brendon Mc Cullum who made the record of the highest individual total ever scored in a twenty20 cricket match, (158 not out) leading his team to victory. Rahul Dravid, on the other hand, captain of the Royal Challengers Bangalore, could not seem to do anything right even after having won the toss and electing to field first! Speaking of today's matches, its going to be really interesting and exciting to watch the two captains clash with each other. I am speaking of the two teams, namely Punjab XI Kings and the Chennai SuperKings. Its going to be fun to watch Yuvraj Singh pitted against Mahendra Singh Dhoni. Not only this, but, both the teams have good players who are aggressive and high hitters (Mathew Hayden, Micheal Hussey Jacob Oram and Stephan Fleming in the Chennai team) and so this match will definitely prove to be a nailbiter with lots of sixes and fours, no doubt! So, Who will be the better Captain? Who will win? The Other two teams ie. Delhi vs Jaipur will also be interesting to see Virender Sehwag Vs Shane Warne! Delhi team has strong players to back Virender Sehwag. Will they be able to beat the Jaipur team? TicketPro is the place to get tickets for IPL matches. You could even buy it online. TicketPro’s Indian website has some details on getting Indian Premier League cricket match tickets. As the mercury rises with the advent of summer, the humidity also rises and causes a lot of skin and hair problems. Summer is the time when you and your kids get a break from work and school and are looking forward to some great outdoor activities, that involve spending a lot of time in the sun. But, the sun can be harsh on your hair and so you need to take extra care and protect it from damage. The sun, heat, humidity and even chlorine from a pool can damage the hair’s cuticle resulting in dry hair, split ends, frizzy and brittle hair. Here are some summer hair care tips that you could follow to prevent damage to your hair. 1. First and foremost thing that we must all remember to do is to drink plenty of water or fluids during the summer so that the body remains hydrated and healthy and whenever possible, wear a hat or a scarf to protect your hair from direct sunlight. 2. Keep your hair short and trimmed. In fact, I suggest that you get rid of all the unwanted hair on your body. But, if you have long hair and do not wish to cut them short then I would advise you to keep them knotted, or in a bun or plaits to avoid total exposure to the sun. This also helps to control the frizziness. 3. You can rub a protective sunscreen on your scalp, if you are planning to stay out long in the sun, to avoid sunburn. 4. Take care to wash your hair with cold water or warm water. Hot water can cause damage to your hair. Also try to avoid using too much of the hair dryer or hair curlers or any other such type of heating devices and if you do then at least remember to use a conditioner before applying them. 5. If you are planning to go for a swim in the pool, wet your hair before getting in. Wet hair will not take in as much chlorine or salt water. But, remember to shower off afterwards and use a good conditioner on your hair to make it soft. 6. Avoid using any kind of alcoholic products on your hair as they cause more drying. Use natural products as far as possible. 7. Choosing a good shampoo for your hair is very important. Make sure that it is gentle. You could also try using a moisturizing shampoo during the summer rather than the normal shampoo. Do not rinse your hair daily with shampoo, as it would deprive your hair of its natural moisture. Instead, you could sprinkle some baby powder in your hair and simply comb it. Don’t forget to use a conditioner after you shampoo your hair. 8. If you have frizzy hair, rub in some jojoba oil in the frizzy areas and wrap it in plastic before going to bed. Shampoo your hair in the morning. 9. Do not use any products that contain peroxide. Stay away from the hair lighteners as they contain peroxide and can cause damage to your hair and also change the color drastically. 10. My personal formula is to rub in lots of coconut oil in my hair, at least once a week (Sundays), leave it on for a few hours and then rinse with a gentle shampoo and condition them. See the effect! In the end I would like to remind you that home treatments are the best for your hair rather than using harsh chemical products that are available in the market. With these simple steps of hair care and attention to your hair, you could avoid summer damage to your hair and keep them looking lustrous, shiny, soft and healthy. * Kindly note: Hair care products designed to add shine, may only add shimmer but not necessarily add moisture. Be sure to read all ingredients on the hair product labels to understand what benefits the product is designed to provide to your strands. The article mentions people dying and generally suffering from ill-health. Blogging Never killed anyone. Neither does a computer unless you stick your wet hand or tongue into the Power supply Unit of the CPU. What the article is stressing upon is the excess or the overworking while blogging. Anything in excess including water is toxic. People in their enthusiasm or lust for money and fame forget the human body's tolerances and stretch it to the limits. Some voluntarily and some due to targets that have to be met. But there is only so much a body can take. And when it can't, it gives up. This is something that applies to all of us and we have to be wary of this fact. Each one of us have to draw boundaries, monetary and otherwise. How much is enough? Nothing is worth throwing your health away. You'd rather have a consistent posting routine and therefore income, than having it in spurts, bedridden the rest of the time. Decide your hours and the desired income and please keep it practical. There are millions of people posting content on the internet. The chances of you beating all of them to the top in Google search every time are not favorable. Just remember there will be good months and there will be not so good ones. Like the stock market it all averages out. Ultimately you get what you deserve and you get it only when you are ready for it. But good health, once gone, is difficult to blog for. Take care. Read also this post by Om Malik who got a second chance after suffering a heart attack. His advice Relax, Chill and Maybe Blog. Kids Walk The Ramp at Lakme Fashion Week - A Mishap Happens, and what the Laws say? The recently held event, of the ongoing Lakme Fashion Week, witnessed the fall of the designer Abhishek Dutta’s one-year-old son from the ramp raising the issue of whether children should be allowed to walk the ramp. The accident took place on the third day of the event, when the toddler was made to walk the ramp with a model showcasing Abhishek’s collection. Although the kid did not show any signs of being hurt, there was no official confirmation of the same! The Lakme Fashion Week, this year, saw the new trend of kids flaunting collections on the ramp. 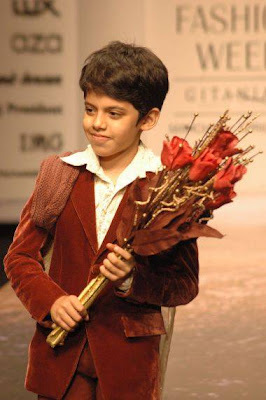 The youngest of them being the Bollywood star, Darsheel Safary, who stole the show as he walked the ramp for the designer Neeta Lulla. This whole event has, yet again, raised the ethical question of whether children should be used or allowed to walk the ramp. This question has been raised in the local “Mumbai Mirror” newspaper yesterday, to find out from the voice of the people their opinions on this matter. While some people agreed that it should not be allowed and that it amounted to child labor, there were those who said that it really didn’t matter! They felt that if children could be used for advertisements and movies, then what’s the harm in walking the ramp? There is also a list of such employments that are considered as hazardous and not safe for children, which include all such industries that handle toxins or harmful chemicals as raw materials. There is, however, no mention of them working in the glamour industry like movies, TV, or walking the ramp. So, is the list incomplete? Should they be banned from this kind of work too? After all, they do get paid for the work that they do. We are all aware of the amount of psychological and physical stress involved in any showbiz! Are the kids ready to handle the kind of stress that comes with fame and money at an early age? There are a lot of questions that need to be answered! But, its not a simple answer. The issue is multifaceted and very complicated… Let’s all ponder at length on this.